This newly released Mars panorama gives armchair explorers a 360°, rover's-eye view of the Red Planet, from a vantage point near the base of Aeolis Mons. Also known as Mount Sharp, the 18,000-foot mound of sedimentary layers forms the central peak of Gale crater, and is the Curiosity Rover's primary scientific target. 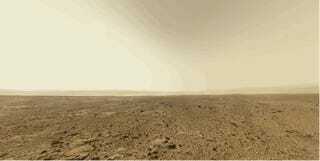 Curiosity's come a long way since her first color photo of Mars, hasn't she? "The images for [the panorama were] obtained by the rover's 34-millimeter Mast Camera," writes 360 Cities' Andrew Bodrov, who created the immersive viewing experience. "The mosaic, which stretches about 30,000 pixels' width, includes 101 images taken on Sol 437." You can interact with the panorama below by clicking and dragging, or selecting from specific points of interest. Make sure you try it out in full screen. Bodrov's done up similar Mars panos in the past, and his work is seriously inspired. Hands down some of our favorite images of the Red Planet. That includes the ones released by NASA.